KILLIN MOUNTAIN RESCUE TEAM ROUTE SHEET. 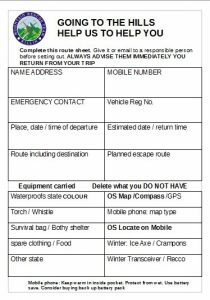 ALWAYS LEAVE DETAILS OF YOUR ROUTE WITH A RESPONSIBLE PERSON WHEN HEADING OUT ON THE HILLS. THIS IS ESPECIALLY IMPORTANT IF GOING OUT ALONE. LET THE PERSON KNOW WHEN YOU ARE OFF THE HILL IMMEDIATELY YOUR WALK ENDS. 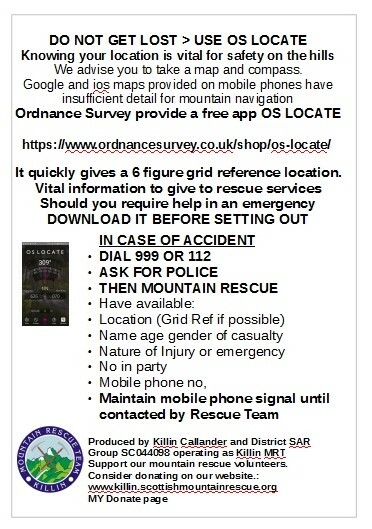 KILLIN MOUNTAIN RESCUE TEAMS ROUTE SHEET CAN BE PRINTED OFF FROM THIS PAGE. 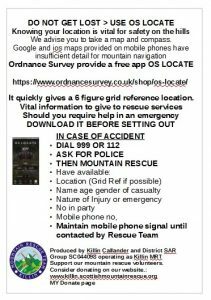 IT GIVES THE INFORMATION RESCUE SERVICES MAY REQUIRE SHOULD YOU REQUIRE ASSISTANCE, AND THE EQUIPMENT YOU SHOULD TAKE TO STAY SAFE. CLICK ON THE LINK BELOW:- route sheet to print. Note: Do not leave route details on this site. It is not constantly monitored.